The trailing bellflower is a pretty perennial which grows rampant in the right conditions. 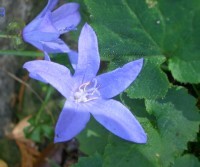 The blue flowers are made up of five or six long, narrow petals to form a star shape, about 2 cms diameter. The hairy leaves are rounded with a ragged edge. This plant is excellent for groundcover or rock gardens.